Experience the pleasure of traditional throwing plus all the smooth control of modern engineering with the Model J Kick Wheel. The AMACO Brent Model J is a reliable and well-built kick wheel that will let you get down to business creating your best pottery yet. The flywheel is specifically engineered to maintain inertia for smooth speed and fine control. The wheel itself is made of an even piece of concrete that weighs 135 lbs and is 30" in diameter, and you will find that it naturally holds a consistent speed that makes it easy to shape your pottery. 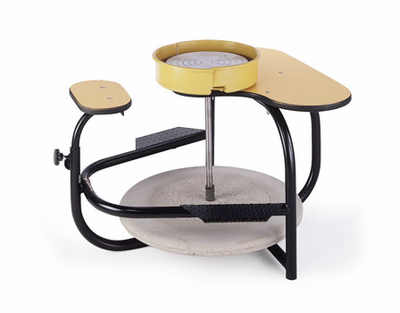 It is designed for optimal foot control, with a rough textured top for kicking and a smooth rim for breaking, plus the whole wheel is reinforced with steel, so that it can put up with any amount of use. The steady motion of the wheel is translated to the wheel head by a steel shaft that is supported by ball bearings, ensuring no variation between wheel and head speed. The wheel head is 14" of cast aluminum with concentric circles already drawn in to aid in centering your work, and it also comes with two removable bat pins. Not only does this kick wheel offer artists fantastic control, but it also allows for unbeatable comfort with an adjustable seat, so you'll never have to sit hunched over or have trouble with room to operate the foot pedals. The Model J Kick Wheel puts you in the best position to master the project at hand. And as an added bonus, it comes with a free 14" Plast-i-Bat. Oversize Shipping cost is $191.45.